Apple just got off the stage where it capped off an announcement for the new iPhone 7 and 7 Plus duo with a Sia performance, and the new handsets are worthy of the multimedia that poured on stage during the show. The rumors that iPhone 7 Plus will sport optical zoom that Apple analyst Ming-Chi Kuo started turned out to be pretty sound, as the handset offers 2x lossless zoom, coupled with 6x digital, thanks to the dual 12 MP camera set on the back. Not only that, but there is new processor, the screen characteristics are different, the home key is clickable no more, and we get stereo speakers. The exterior may be housed in the same dimensions as the 6s Plus, but the 7 Plus is now water-resistant, hosts two stereo speakers, has the antenna bands integrated in the sides, and sports some brand new coloring, so check out all the new features that are fit to print below. Apple placed two 12 MP cameras on the 7 Plus for some nice bokeh effects and shallow depth-of-field focusing that is not new to the smartphone scenes, but if executed right in the hands of true photogs can add an extra layer of artistry to your images. Apple is going above and beyond the extra mile with its new iPhone 7 display calibration, offering a mode that covers the cinematic P3 color gamut. That is a step above Adobe RGB even, not to mention the standard RGB gamut, so the display can offer way more vivid colors than what we have now, making it futureproof. For the first time Apple introduces four processing cores in its phones, set in a big.LITTLE architecture, promising faster calculations and higher power efficiency, not to mention more immersive console-level gaming from the sped-up GPU. Yep, the removal of the ancient audio jack left Apple some more space to play with inside the 7 Plus, and it got equipped with stero speakers, for, well, those times when you car battery dies during a tailgate beach party. 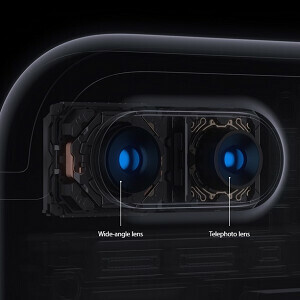 The front camera has also been upgraded from the 6s Plus shooter, now featuring 7 MP resolution, larger pixels, and wide color reproduction. The 7 Plus still sports a two-tone flash, but this time the illumination is provided by four LED lights for 50% brighter field, accompanied by a sensor that measures the flickering provided from artificial lighting, and compensating accordingly for more realistic low-light shots with the flash on. Stop the presses, no more clickable home keys on the iPhones! Apple has leveraged the unique Taptic Engine that provides feedback for the 3D Touch display by offering a similar experience embedded in the home key, which is now of the capacitive variety that doesn't require pressing, just various tapping and pressure combos to serve a variety of purposes. The iPhone 7 Plus comes in a glossy Jet Black that looks like a piano finish, and a more subdued matte hue that is called simply Black. The iPhone 7 Plus will now start you off at 32 GB of basic storage, jumping to 128 GB for a Benjamin extra, and another $100 will still keep the price under a grand, yet bring you no less than the whopping 256 GB to play with - hey, that's as much flash memory as on some recent thin and light laptops. Apple water-proofed the 7 Plus to an extent that it can withstand the occasional splash and dunk in water, so that you can rest in tranquility when the rain pours down and you get a call, or, officially - it can be submerged in three feet of water for up to 30 minutes without damage. The iPhone 7 Plus supports up to 25 LTE bands, ensuring compatibility with most 4G networks out there, plus it now offers up to 450 Mbps LTE-Advanced download speeds, in addition plus will now start you off at 32 GB of basic storage, jumping to 128 GB for a Benjamin extra, and another $100 will still keep the price under a grand, yet bring you no less than the whopping 256 GB to play with - hey, that's as much flash memory as on some recent thin and light laptops. It's 2x optical zoom with 10x digital. You mean 10x total. After 2x it reverts to digital zoom. It's not 2x optical zoom. It's 2 different lenses. 2 different cameras. You only have 2 optical focal lengths. Wide and very slight telephoto. Nothing optical in between. So if the wide is 28mm and the optical is 50mm there is no 29-49 optically. Hence not a 2x optical zoom. Just 2 different cameras. Spectacular! Loving all the never before seen features. Oh come on, don't just throw out these blanket statements. If you haven't seen waterproofing, stereo speakers, dual cameras, no headphone jack, more than 720p with wide color gamut, etc before, it's because you've had your head up.... in the apple tree a never even considered anything else. At least state something new you liked that is actually never before seen. Tim was a little less arrogant this year. But there were still a few too many "world's best" thrown around with zero supporting evidence. Just call it Apple's best and save yourself the humiliation of losing the title in a month when something new comes out. Your fans will still be happy, and the rest of us will make a little less fun of you. Its a problem with Apple fans. Since common knowledge says these guys will buy anything Apple tells them the stuff John Knotts said sound like what real Apple fans will say that these very old features that are almost standard in the Android world are somehow "one of a kind" and "never before seen." Weren't vivid colors in Samsung SuperAMOLED displays in the past, always a con because they produced 'vibrant' but unreal colors? You're looking at this a little incorrectly. SuperAMOLED has a Basic screen setting that renders colors completely accurate and natural. Oversaturation and wide color gamut are 2 completely different measurements when dealing with color. iPhone won't be over saturated. As much as I don't like AMOLED screens Sammys screens are not over saturated . Right. If anything they are unsaturated. You have a noticable blue tint with any SuperAMOLED screen and this makes pictures with washed out colors. The best screens right now are Sony. Not only do they have true color in their IPS LCD displays but they are pretty much the only company that translated that into full out HDTVs with their Triluminous display. Beautiful vivid and true color. Nothing too spectacular and pretty clear cut showing of how Apple has been playing catch up with Android phones. Waterproofing is not new. Neither is taking out the physical home button or stereo sound. Dual cameras are a thing these days. But Apple did take a huge step backwards in time. Taking away the 3.5mm standard headphone port? Bringing in a Lightning connector headset? That was the key hardware feature of the phone that their iPhone beat almost 10 years ago. The Motorola RAZR V3 had a special headset with a USB connector that pretty much only worked on a RAZR phone because RAZRs didn't have a headphone port and these headsets couldn't work on a regular phone's USB port. What happened was that people drifted away from the phone that couldn't support normal headsets. People are already switching to Samsung just for the headset jack so good job Apple. Way to fossilize yourself for the competition. We don't really know that if it will or not, and I think the point is that it feels like a "something something apple" -> great! "something something someone else" -> not great Which personally just make me sigh. Better than I was expecting but still far behind Samsung, lg and moto z camera in features and performance. Well see how it compares. Not an iPhone fan, but this one is really good. 2x optical zoom will be great for portraits, especially because of the f/1.8 for a nice shallow depth of field. That's a big deal. Battery life improved marginally, but 6S Plus already lasts me longer than my Note 5 did so no worries. I wonder how screens on the iPhone 7 will be replaced having the touch ID sensor embedded. Hopefully the home button is still removable from the screen assembly. You will not get shallow depth of field from a wide angle lens with portraits unless it's of their nose. The telephoto end is f2.8 you will not get shallow depth of field with a small sensor and a 2.8 let 's at 56mm. I don't know if its ONLY me that realised this SO PLEASE Comment if you have too. But Isn't A LOT OF Apple's things copied from HTC? I think Jony IVE actually researches HTC. First the design from before but now even the features - For EG look at the home button itS EXACTLY the same as HTC's home button (capacitive and gives vibrations depending on pressure), look at the "stereo speaker" arrangement , same with HTC - the earpiece and bottom speaker count as Stereo Speakers AND not to mention the idea of HTC m8's dual camera ????????? Is it only me or ? I don't know. And also don't forget their live photos..
Guys i am confused on choosing betwen iphone 7 and 7 plus.... I want to buy iphone 7 which is very handy to me but i want to get info that is there any major difference between their cameras....if not so then i will go for iphone 7... Plz give me ur suggestions..